Image caption Junior doctors say they want a contract "fair to both junior doctors and the health service as a whole"
Junior doctors in England are to be balloted on industrial action over government plans to introduce a new contract from August 2016. Critics say the new contract involves pay cuts of up to 30%, with "normal hours" extended to include 7am to 10pm on every day except Sunday. 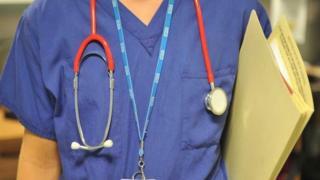 The British Medical Association said the ballot reflected doctors' anger. But the government described the current contracts as "outdated" and "unfair". The BMA said the sticking point was over NHS employers' refusal to budge on classifying Saturday shifts in the same way as weekday ones. Junior doctors get extra payments for work outside "normal hours" - which are currently classified as 7am to 7pm, Monday to Friday. Chair of the BMA's UK junior doctors committee, Dr Johann Malawana, said it wanted a contract that protected patient safety and was "fair to both junior doctors and the health service as a whole". "We can only do this if the government is prepared to work collaboratively in a genuine negotiation. Unfortunately, they have chosen to ride roughshod over the concerns of doctors with their threat of imposition." A Department of Health spokesman said "We really value the work and commitment of junior doctors, but their current contract is outdated and unfair - the best way of changing that is negotiation." Danny Mortimer, Chief Executive, NHS Employers said: "Imposing a contract is not the preferred solution of any party - the door is still open for the BMA to come back to the negotiating table and we urge them to do so." In 2012, the Department of Health called for changes to a junior doctors' contract which dated back to the late 1990s. The BMA agreed to discuss terms and conditions for their members. After two years of talks, negotiations broke down. In August this year, the BMA refused to go back to the negotiating table, accusing the government of a "heavy-handed" approach, and ministers then said a new contract would be imposed. The Scottish and Welsh administrations, however, have said they will continue with current arrangements. The case for contract reform surrounds apparent inconsistencies in what is described to be a highly complex system which can result in varied working hours in different trusts. A more transparent system and with payment linked to responsibilities is what the employers claim to be seeking. This would involve higher basic rates of pay than now, which would mean higher pension entitlements. While NHS employers acknowledge some doctors would lose out, they argue that some would gain. Correction 9 October 2015: This report has been amended to clarify that rather than overtime rates being scrapped, doctors' "normal hours" are being extended. Junior doctors - trouble at hospital mill?